To learn how to make this pet, speak with any high level Gnomish engineering trainer. The created item is BoU, allowing it to be traded and sold to other players. I had one drop from a Blingtron 6000 yesterday. This is the cutest little bunny in the game in my opinion! So adorable to have him hopping along behind you! Really liking this little rubbot. One of the few 325 speed mechanicals, with the usual power vs beasts. But with Extra Plating and if you really want it Repair, this one can be truly durable as well. I prefer to use Thrash, which benefits from speed, and Demolish(which goes really well with Extra Plating and hits for over 500). With 325 speed you probably won't get much extra benefit from Overtune. Is this good as a battle pet? Anyone leveled up one? There seam to be 2 versions of this pet, a blue quility one and a green quility one, ironically the green one sells for more on Feathermoon, not sure if thats the case anywhere alse though. Scratch that...I used it and it went green. Ironically this pet's model looks better than actual rabbits in the game. yeah this one I wanted so bad. I have an engineer but not high enough so one of my guildies had the pattern and I asked him. Now I have him making more. I want all my toons to have one of these cute little critters! MY OWN ARMY! BAHAHAHA.....haha.. 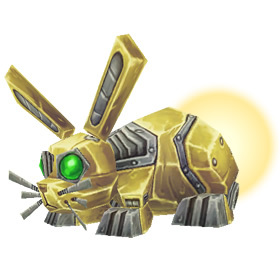 It's really a fel reaver with the head of a rabbit. Also, the body of a rabbit, but it's a different rabbit! How could I resist this thing? It's a rabbit and a robot! It's the most allitarive type of pet there is! The good news is Patch 4.06 increased the amount of Electrified Ether produced to 2-3 per 2 craft so the most costly component is cut to 8 max, 6 if you are very lucky. Also the number of people doing transmutes continues to rise, so the price drops and the newer engineering pets will continue to drop in cost. Cute little pet, I am glad I made him.